To read Libby Fischer Hellmann is to love Libby Fischer Hellmann. Her writing is tight, fast, and highly entertaining. When I first read her Ellie Foreman mysteries, I set her as the standard that series fiction should aspire to. But I had no idea Libby was so versatile. My first inkling of this came a few years ago, when I asked her to contribute a story to an anthology I was editing. Frankly, I didn’t think she’d make the cut. While Libby doesn’t shy away from being tough in her writing, her Ellie books were not what I’d call hardboiled, and my anthology was a collection of hit man stories. I figured I’d give her a token invitation just to be polite, and I’d never have to reject her because she’d never submit anything. Boy, was I wrong. Her story, DETOUR, was pure, adrenalin-fueled noir, and wound up being one of the best of the book. Perhaps that was a catalyst (if it wasn’t, I still take all the credit) because soon after DETOUR Libby began writing some seriously diverse and seriously good yarns in various genres and sub-genres. She also edited the acclaimed hardboiled anthology, CHICAGO BLUES. 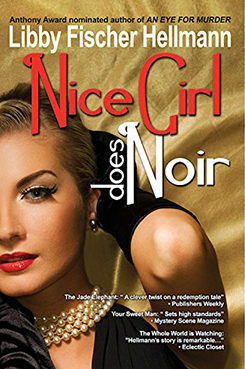 She’s still great at the light-hearted suspense she’s known for, but the stories in NICE GIRL DOES NOIR—all previously published—offer a wide variety of styles, tones, and topics. Funny. Dark. Poignant. Exciting. Surprising. And yes, even hardboiled. JA Konrath is the author of over a dozen thriller novels. You can find him at www.jakonrath.com. Nice Girl Does Noir was translated into Italian in 2011. You can find out more about it here. I don’t usually like short stories, but these are terrific! I roared through them. Hellmann had a good mix of Chicago historicals and contemporaries. My highest recommendation here. When Hellmann explores the less sunlit areas of Chicago, her canvas becomes not only more universal but has greater depth and emotional value. Aspiring short-story writers would do well to pay attention.